Clay pots and saucers can be painted with patriotic colors and used as decorative candle holders for the 4th. This is a guide about making 4th of July candle holders. These candle holders are made from clay pots. 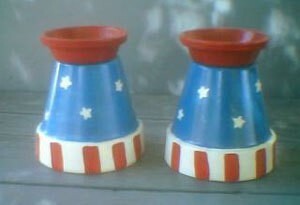 Paint the pots and saucers in patriotic colors, let dry, then stencil on stars or stripes or free hand it. Just use your imagination. Let dry. Seal if you like, then put in candles. What lovely pots you made, so simple but cute! I just love your creation! I am going to have to try this with my kids-they are already getting bored on summer vacation! !